A Typical Mill View Mountain Day. 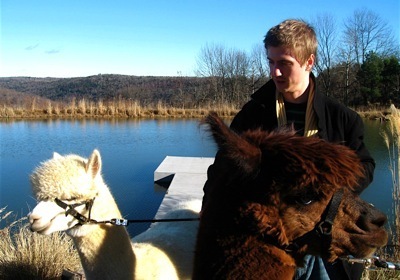 . .
Before we decided to make alpacas a focus of our lives, and because we had no previous farming experience, we visited many farms and spoke with many farmers to see just how they fit these animals into their daily activities. It’s strange how the desire to make something a part of one’s life creates an awareness that to do so successfully takes a great deal of planning, study, hands-on experiences, enthusiasm and perseverance. We were pretty sure that we had what it takes to be livestock owners, but we wanted to be certain that we could actually give alpacas all the care, attention, training and devotion that they need to not only survive, but to thrive. We learned many, many different approaches to daily routines, but it took having our own animals on our own land, in our barn and in our pastures to figure out just how we were going to conduct our daily activities. No one approach is better than any other, but we have developed the one that has certainly been best for us—and this approach we developed one day at a time. We learned what times were best for feeding grain, cleaning buckets, getting hay down from the hay mow (rhymes with bough), collecting dung, and many other activities. Our typical day begins around 9 am when we arrive at the barn. If the weather is good, the alpacas have already been grazing in their pastures for about an hour. “Good” weather for us means no heavy downpours. They will graze when the fog is so thick that we cannot see them from the house: we know they are grazing only when we get close enough to hear their munching. Of course. if we can see them, they can see us, and into the barn they come—running at top speed. It takes us a few minutes to mix the supplement into the grain and then dole out each animal’s morning portion. A lot of place-changing occurs with crias sharing their mothers’ grain and then finding their own supply. We fill a few additional bins with grain so that all will get their fair share. 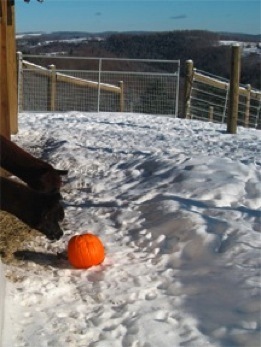 We didn’t believe that this method could work, but it is successful, at least in our barn. 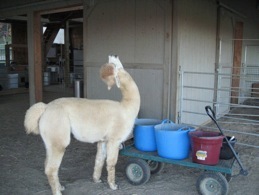 While the alpacas eat, which takes less than ten minutes, we feed the barn kitties and refresh their water bowl. Our barn cats are indispensable for keeping rodents and snakes out of the barn areas—and for making us laugh at their antics. When all have finished eating, and if the hay containers are empty, we get hay down from the mow using the hoist (great aid for tired backs) and then distribute the hay. The herd loves fresh hay, and will often pull bits out from the flakes as we carry them over to the bins. After munching on the hay, the herd kushes in the barn and under the overhangs chewing their cud and ruminating. 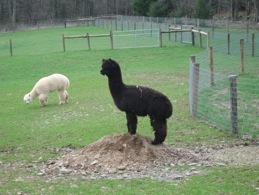 We do some ruminating, too, as we move on to our next chore: cleaning up the bean piles (or dung, poo or poop piles). 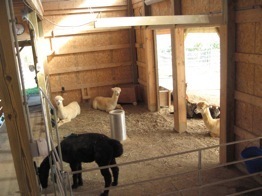 When we first moved alpacas into the barn, we decided to create dunging areas that were placed where WE wanted them to be. We “seeded” with dung two areas, one on the girls’ side and one on the boys’ side, and believe it or not, they began to use these areas as soon as they arrived on our farm, and continue to use them to this day. We have no bean piles in our barn. Try it, it may work for you, too. We then clean the pastures because the herd also creates community dunging areas there as well. Camelids will not graze near these pasture piles, but keeping them cleared helps to keep down parasites that easily spread in an uncleaned pasture. When all dung has been collected it is carted off to the compost heat. The compost pile is downhill from all the pastures to prevent runoff entering the pastures. By the way, the compost grows lovely flowers and delicious veggies. We now take the time to clean the water bowls from the two automatic waterers, and the electrolyte buckets that hang on the barn walls, one on each side. We refill the supplemental mineral bins if needed, sweep the barn floor, pet the kitties, and then go up to the house for a well-deserved (at least we think so) cup of coffee. And that’s it until feeding and cleaning time comes again—around 5 pm. For us, this evening time is less hectic as not every chore needs to be repeated. During daylight hours, on special days, we spend time with activities such as halter training, walks, and herd health days. We learned how to give shots, and trim toe nails and teeth. Sometimes we join our herd in the pastures for some quiet time of our own. This time provides many opportunities for photos. The message that we want everyone to get from this daily record is that taking care of alpacas is not a chore. Yes, some days we wish that just one of our animal friends would come over, put a fuzzy leg around our shoulders, give us sweet, breathy “kiss” and say, “don’t bother cleaning those buckets today, we’ll be ok with just our plain, delicious mountain spring water.” OK, so we’re dreaming—but that’s how alpacas get into our hearts. 2.Aurora Vickery of Mill View Mountain meets Aurora of Mill View Mountain! 3.Meet Margeaux of Mill View Mountain. Here, she is just two hours old, and can already stand and run. 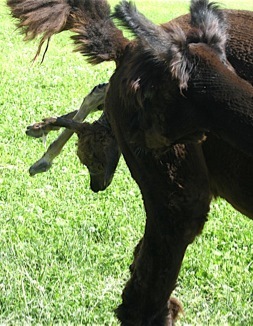 Brandy was so excited about the birth that she did a little dance around her newborn. 4.Our friend, Lauren Staman, shares a sweet moment with our Milli. 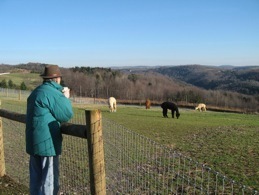 5.The morning is cold, the coffee is hot, and Neil is spending a few quiet moments watching the herd. 6.Time for ruminating after the morning grain. 7.What is it? It’s a curious, delicious treat. 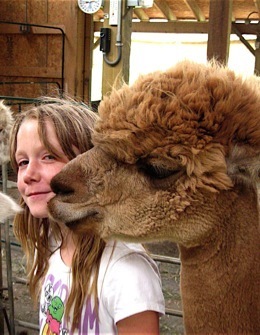 8.Children and alpacas are a terrific combination. 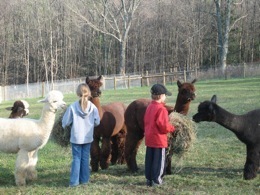 The alpacas seem to sense the need to be gentle around little folks. 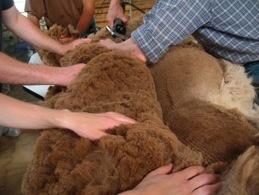 9.Shearing day is hectic, but with lots of helping hands it goes smoothly. This is the day on which we reap the reward of a year’s work: beautiful fleeces! 10.Flehmen, usually displayed by males, allows alpacas to detect the presence or absence of hormones that indicate the readiness of a female for breeding. Here, Del is testing the dung that has just been collected from the girls. 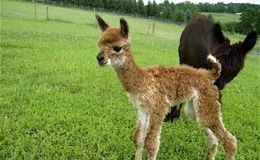 12.Brandywine is giving birth to her cria. Is it a girl or a boy? It’s a girl, Margeaux of Mill View Mountain! See photo 3 at right.
. . . and not so typical, too: shearing, birthing and nail trimming, oh no!